I love turtles. I don't mean the pond dweller or the super hero. No, I'm talking about that delectable chocolate, pecans and caramel candy. I have seen this classic flavor combination translated into a number of desserts - turtle cheesecake, turtle cupcakes, turtle cookies. Recently, I was looking for a recipe for turtle biscotti - chocolate biscotti with pecans and caramel mixed in. But, the only recipes I found didn't mix the caramel into the cookie but rather used it as a drizzle on top or a coating on the bottom. That was not what I was looking for so I decided to tinker around with a chocolate biscotti recipe that I have to see if I could capture what I was seeing in my mind's eye. After a couple of batches, I hit pay dirt! These turtle biscotti are exactly what I was looking for: sturdy, as biscotti should be, but also chewy from the incorporation of both chocolate chips AND caramel bits. Would you like to try them? Okay. Let me share my recipe with you. First, you will need to get some caramel bits. 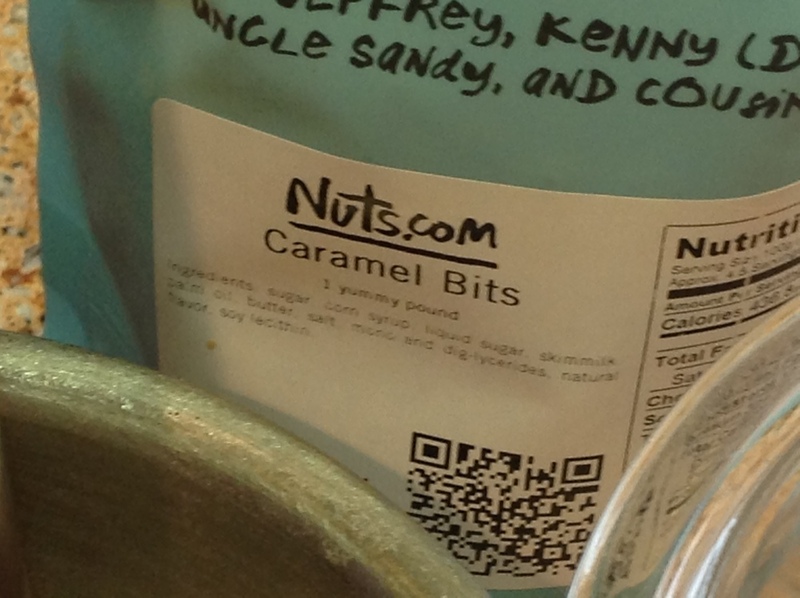 I get mine online from Nuts.com. These caramel bits are small round nuggets which stand up very well to the baking process. They hold their shape and stay soft and chewy after the cookie has cooled completely. They are $4.99 for a one pound bag and they seemingly arrive at your door almost as soon as you place the order. The customer service team at nuts.com is that good. Preheat your oven to 375 degrees. While the oven preheats, toast 3 ounces (healthy half cup) of chopped pecans in a nonstick pan over medium heat. Watch the nuts carefully because they can go from toasted to burned very quickly. Toss them in the pan frequently to prevent burning. The pecans are toasted when you begin to smell that heavenly pecan aroma. Remove the nuts from the pan and let them cool while you get your ingredients together and mix up the dough. In the bowl of your mixer, cream together 1/2 cup of softened salted butter and 2/3 cup of granulated sugar until light and fluffy. To the butter/sugar mixture, add 1/4 cup dutch process cocoa powder, 2 teaspoons baking powder, 1 teaspoon expresso powder, 1/2 teaspoon salt and 1 teaspoon vanilla and beat for two minutes. Don't worry if you don't have the espresso powder. I usually add it to my chocolate baked goods because espresso powder really enhances the flavor of the chocolate in the recipe. Egg fully incorporated - no slime! Next beat in 2 large eggs, one at a time, until each egg is fully incorporated into the dough. How do you know when an egg is fully incorporated? I tell kids that an egg is fully incorporated when you can no longer see any slime from the egg. It's kind of gross but it gets the point across. Stir in 1-3/4 cups of all purpose flour, then stir in 4 ounces of caramel bits, your toasted pecans and 1/2 cup (3 ounces) of semisweet or bittersweet chocolate chips. Cover the dough and chill it for about 10 minutes. After chilling the dough, divide it in half and shape each half into a log about 9 inches in length. Place each log on a parchment lined baking sheet four inches apart. You want to leave this much room because the logs will spread as they bake. Press the logs down to flatten them slightly. Bake the biscotti for 20 to 25 minutes until a tester comes out clean. Cool the biscotti on the pan for five minutes and then slide the biscotti while still on the parchment sheet onto a rack and let them cool for one hour. Reduce the oven temperature to 325 degrees. After the biscotti have cooled, remove the logs from the parchment and return the parchment to the baking sheet. Cut each loaf on the diagonal into 1/2 inch slices and place the slices back on the baking sheet. Return the slices to the oven and bake at 325 degrees for 10 minutes. Check the biscotti for the desired degree of doneness. For crispier cookies, bake for up to an additional 7 minutes. Cool the biscotti completely and store them in an air tight container. There you have it! Turtle biscotti. Don't they look yummy? Just look at those caramel bits. Mmmmm! Enjoy!